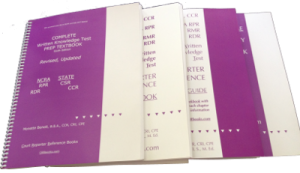 Plus: NCRA RPR, RDR, and State CSR Purple Books ~~ DIO = Done In One! OTO = Only Test Once. 98% successful pass rate. Plan Now! 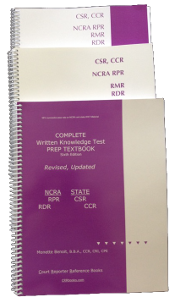 Prepare Now for NCRA RPR, RDR, and State CSR Exams – Test Once. Mary S. Agren; Deanna Baker; Martin H. Block; Jack Boenau; Judith Brentano; Robert Clark, NCRA Librarian-Historian, Emeritus; Kevin Wm. Daniel, author, "Writing Naked;" Kathy DiLorenzo, VITAC; Kevin Donnelly; Steven Edmondson, author, "Literary Moments;" Joshua Foley; Kay Ayers Frazier, Clark State Community College; Anthony D. Frisolone; Pamela Giardina, Baton Rouge School of Court Reporting; Marc Greenberg, owner of SimplySteno Speedbuilding Program and film director of "For The Record"; Gayl Hardeman, Hardeman Academy, author, "DePuzzLer;" Melanie L. Humphrey-Sonntag; Cheryl Hoover; Mary Knapp, author, "Complete Court Reporter’s Handbook;" Mary Beth Johnson, Program Coordinator, Community College of Allegheny County; Judy Larson, St. Louis Community College at Meramec; Richard Lederer, NCRA language columnist; Robert W. McCormick, co-author, "The Complete Court Reporter’s Handbook, Third Edition;"